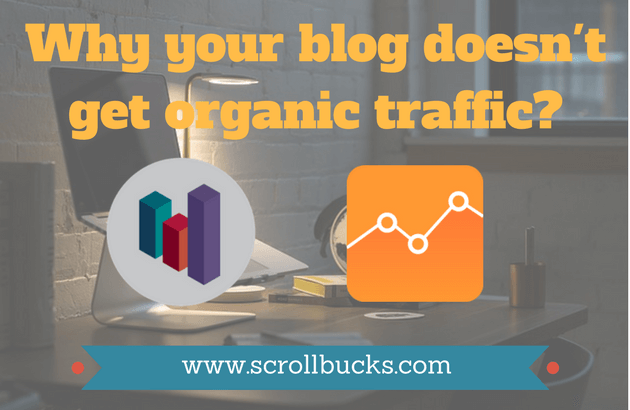 Your blog is not getting enough organic traffic here is why? Blogging is not one day work it will take weeks, months, years to get success. It is possible only when you keep moving forward, never give up. I met few bloggers in online forums, and I found from their conversation that they are not satisfied with the organic traffic to their blog. Even I have seen some bloggers quitting their blog because of weak organic traffic. I don’t think they have analyzed this problem more deeply to find out why they are not getting more organic traffic. Obviously, as a beginner, it’s terrible to know the cause of it, but at least you can try to work on it. I was facing the same issue with my blog. Initially, I was not getting more enough organic traffic which I expected before starting this blog, but still, I have not stopped doing hard work on blog’s performance. Till now I have improved lot of things of my blog to get it more SEO friendly. I have hired some freelancers to fix the coding issue, to redesign my blog, to design a nice logo, etc. (you will get freelancer for your work on Fiverr just at 5$). After a few months, I have observed that the organic traffic to my blog has been increasing day by day compared to the past. In my two years of blogging journey, I have seen few discrepancy in the organic traffic to my blog. I have sorted out some points which will help to analyze your blog. If your blog is not getting enough organic traffic, then check below for the below things. I am sure it will help to increase organic traffic to your blog. Have you added right keywords in the blog post? Writing the quality content only will not satisfy the search engine. You should have to find the right keywords for the search engine. Some bloggers just write content without adding proper keywords, sometimes google will find them on organic search but not all time. Without proper keywords, you will not get organic traffic(search engine traffic). Before adding keywords, you should know which keywords are right for your content or niche. Initially, I have not added single keywords in my blog post. Apparently, I was not getting any search engine traffic. When I realized that the keywords are the heart of the content. I started adding keywords but adding any keywords will not worth you should add right keywords for your blog. If you are not adding any keywords, then start from now. Find proper keywords and try to optimize it. Google will love your content. Does your content satisfied readers? In blogging field content is king, everything depends on the content. No one will read how’s your blog or design of the blog if they love your content they will revisit your blog. Writing content is not a big deal but writing a quality content which will be satisfied the user’s matters a lot for readers. Before writing any post find out the requirements what users want and then write it because if your content is good, then only readers will come back to your blog. You have to win the trust of users by your writing. How to promote blog post after publishing? How are backlinks useful for improving page rank? Some of you will think that it’s not an important to point but seriously speaking if your header tags arrangement is not appropriate then undoubtedly it will affect SEO. When I have started this blog, I had no idea about the arrangement of tags, and even I didn’t know that it will affect SEO. As the days pass, I realized that header tag is also an essential part of SEO optimization of the blog. I read some tutorial about how we can arrange header tags in our post to get out content more SEO friendly. I have combined all these three points at one point because interrelated. Almost 80% of people attracted to your blog post just seeing post title. If your post title is right, then half of your work is done (check out this post title). Permalink is as crucial as the post title. You should keep the link of the post SEO friendly and add at least one keyword. The Meta description is the abstract of your post. You should write it in a way that people will know what the content of this post is. Also, add one keyword in the meta description. It’s better if you add LSI keywords in the meta description. It’s straightforward to find out LSI keywords, only search your keyword on Google, and at the end of the results you will see related searches, pick up that keyword and spread all over your post. Check these three points whether you are doing it properly or not. I would suggest that before writing any post think all these three things what we should write here? How to setup SEO by Yoast plugin with your WordPress blog? How to fix broken links on your WordPress blog without affecting SEO? I would recommend you to create compelling images for all your blog post. You can use any tool for images creation (I am using Canva). Make sure that the name of the picture is related to your blog post and if possible add one keyword in your image name. Don’t forget to add alt tag in the picture it’s critical for Image SEO. I share the post on the Facebook page, Google page, Twitter profile. Share it on the LinkedIn profile. Share that content on different Google plus communities. Answer the question related to the content on Quora and add the link to the post. Share that content on various forums. Use 80-20 formula for your promotion strategy of content, and more you promote your content more you get social traffic. I would suggest you that note down your promotion strategy like what will you do after publishing a post, work according to it. Social traffic is as important as organic traffic. As you know that Currently, social media is the powerful medium spread your content worldwide. I would like to tell you some success tips which I have been learning since last two years of blogging journey and which will motivate you for your future career. Keep it in mind that blogging is not one day work. It will take months, years depending on your job. If you want to succeed never give up, once you renounce your dream will end at that moment. Don’t compare your work with others, and they succeeded because of hard work. Focus on your dreams, don’t lie to yourself. Don’t copy others, create your path and move on. Keep it in mind that you are the creator of your empire. So, friends, if you check the above points with your blog and implement these techniques on your blog then definitely it will help to increase organic traffic to your blog.Still, if you have any doubts related to organic traffic then let me know I will try my best to solve it soon.